On November 14th 2013, we wrote to the Council to submits comments on the proposed redevelopment of 4-8 Hafer Road. We have some sympathy for the current resident who said they wish to redevelop their home and to do so need to redevelop the entire building to pay for their plans with extra units to be sold. The scheme proposes to replace a few 3 storey small residential blocks in the style of former council houses, with a modern 4 storey building. We are not against the redevelopment of the current houses, and we acknowledge that the proposed building will not be much taller that the houses on one side. However the total footprint of the construction will be more than 3 times as much as the current dwellings. As a consequence it will be very imposing and with a quite different style to the Victorian terrace houses that characterize the rest of the area. Isn’t it a characteristic of over-development? We would like to see a reduction in size/footprint of the building, along with a more sympathetic treatment to match the other buildings in the rest of the street (the proposed design elements of the front balconies make it wildly anachronistic within the streetscape). As an example of similar development we can look at Mossbury Road where P.A. 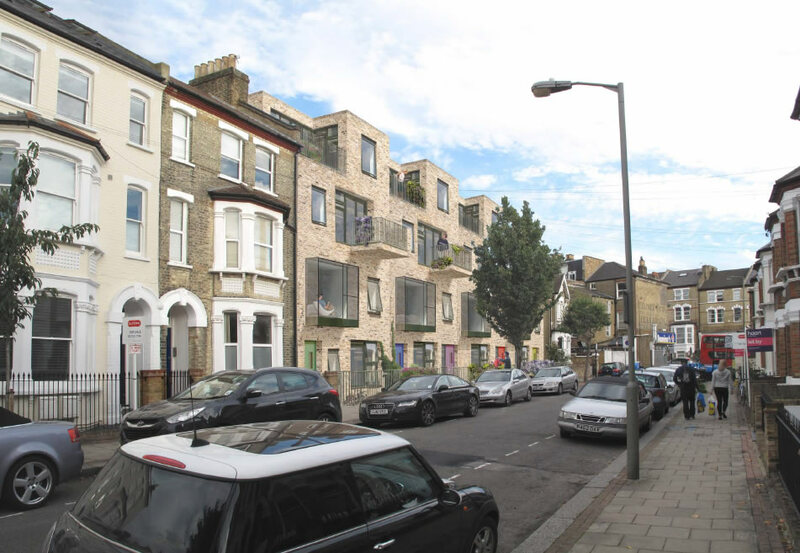 2010/1620 was granted for 6 new units matching in a more sympathetic way the other terrace houses of the street. In view of the recent amendments and additional visual documents submitted, we are now in a view that this is completely out of context within the Victorian-style of the surrounding. Therefore we join the many local residents to object to this plan. We think that this modern building does not respect the character of the area in anyway, in addition to having already many characteristics of an over-development. It is odd that this application was not stopped at the consultation level, before to go to planning, and architects and owners encouraged refraining from this complete new design out of touch with the vicinity. If you want to comment on the application, this is here.